By the time we were on our way to Cappadocia, it seemed everyone had got there before us. Which was great for us as we’d plucked everyone’s brains and got a bit of an idea as to how we would tackle one of the world’s most fascinating places. 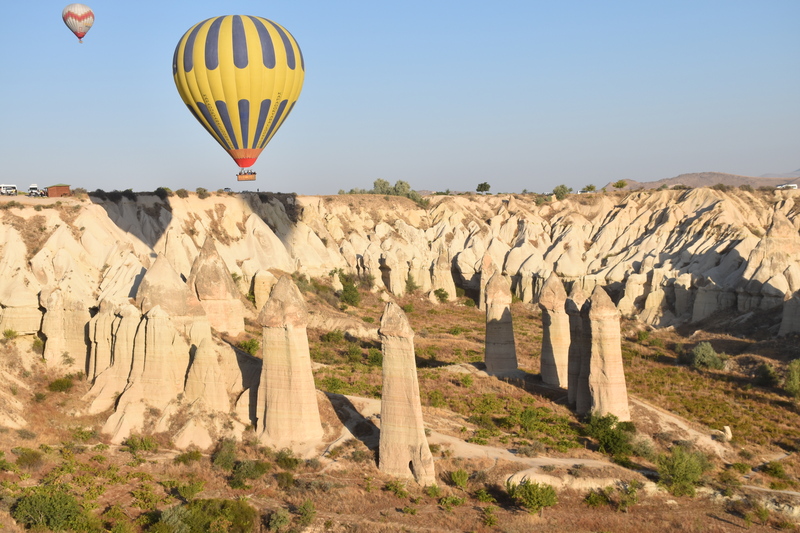 You can’t find Cappadocia on a map – it a sort of region bound together with a whimsical fairytale landscape that seems to have been transported there from the moon. It’s both odd and beautiful at the same time with its towering boulders and honeycombed hills where erosion has formed caves, clefts, pinnacles, “fairy chimneys” and sensuous folds in the soft volcanic rock. All this is wrapped up in some fascinating history. 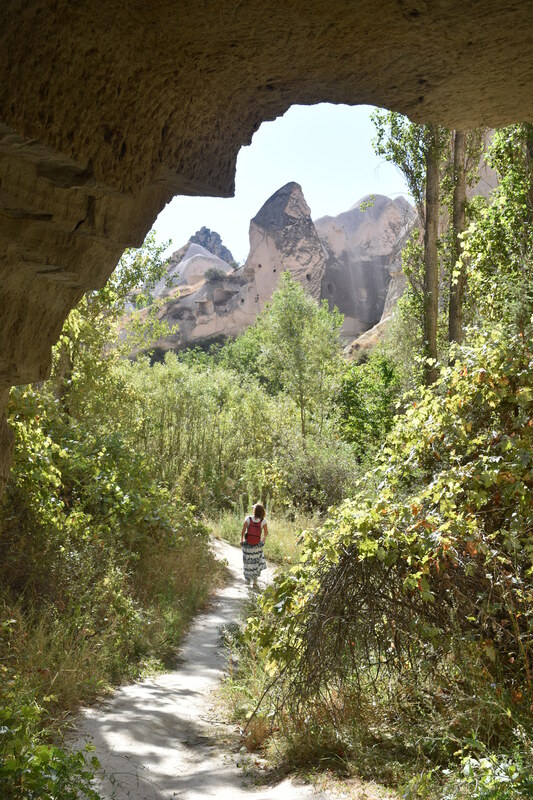 People have long utilised Cappadoccia’s soft rocks, seeking shelter underground and leaving the countryside scattered with fascinating troglodyte-style architecture. Firstly it was the Hittites but really the region is famous for the early Christians that settled in these caves and underground cities. Cappadocia even gets a mention in the Bible (evidently). We started our Cappodocia adventure by driving to Goreme and going on a bit of a hotel selection expedition. We wanted a cave room with a view and a pool. We quickly gave up on the pool as they tended to be indoor or very small. After much walking around we settled on Lalezar Hotel, which had been recommended to us by a couple of different friends. We managed to negotiate the top floor suite for 150TL a night. Was a really spacious cave with a great private balcony out the front overlooking Goreme. Perfect. Next morning, we were up early to check out the 200 or so balloons as they came past. We watched a few go by from our balcony and then headed up the top of the hill behind the town to get a really good look. 200 balloons – that’s probably 2000-3000 people a day, every day over peak time. What a sight. After breakfast, we hooked up with Red Dot (real name Vedat), a Uni student in Cyprus who was helping out at the Hotel (which his Dad owned) and went exploring. Red Dot acted as our guide as we started to get a handle on Cappadocia. First stop was Cavusin, where Red Dot took us on a windy narrow road up to a lookout behind the town with some cool churches, cave houses and a cave hotel. After a quick stop to look out over the top of Rose Valley, we headed across to Love Valley. Looking down on all the phallic symbols, we got the gist of the name. The Turkish are evidently far less subtle. Hopping back in the car, we drove into Love Valley and had a walk around the bottom of the phallic playground. At this stage we were getting hungry so we headed for Red Dot’s favourite restaurant in Avanos. Lunched up, we then headed over to Monk’s Valley in Pasabag. Pasabag valley contains some of the most striking fairy chimneys in Cappadocia with twin and even triple rock caps. Whilst perusing the chimneys, we also found out this is where Red Dot used to take his girlfriend for some after hours activities. Our final stop of the day was Uçhisar, with its natural rock citadel forming the tallest point in Cappadocia, visible from just about everywhere we had driven. Interestingly enough, Rd Dot hadn’t been up the castle before so we treated him to something new. That was just about enough for Day 1 so we headed back and booked our balloon trip for the next morning. We checked out a few companies and settled on one Red Dot had recommended. The trick is to get one with a medium-sized basket (about 12 people) rather than the 25 people baskets. It cost us a bit of dough – 250 Euros from memory, but it was my first time in a balloon and what a way to start. There’s two takeoff times, the first just before dawn and the second, just after it. We were on the second and we took off just behind the Zelve Outdoor Museum, which we got a great look at from the air as we flew low over it. From there we popped out over the range and looked down into firstly Red Valley and then Rose Valley. We then headed over to Love Valley and our captain expertly dropped us down inside the valley amongst the giant phallic symbols. After 50 minutes it was time to land and our pilot amazingly used a small valley to get back (against what was a light breeze higher up) to our landing spot. After the obligatory champagnes, it was back to our hotel in time for breakfast. What an experience. Then it was time for more exploring. We took off down the road to Goreme Open Air Museum. Yet another of Turkey’s Unesco World Heritage Sites (one of the two oldest in Turkey) that we visited on our Road Trip, the Göreme Open-Air Museum is a walk through an important Byzantine settlement that contains the finest of the rock-cut churches, with beautiful frescoes still showing after all these years. 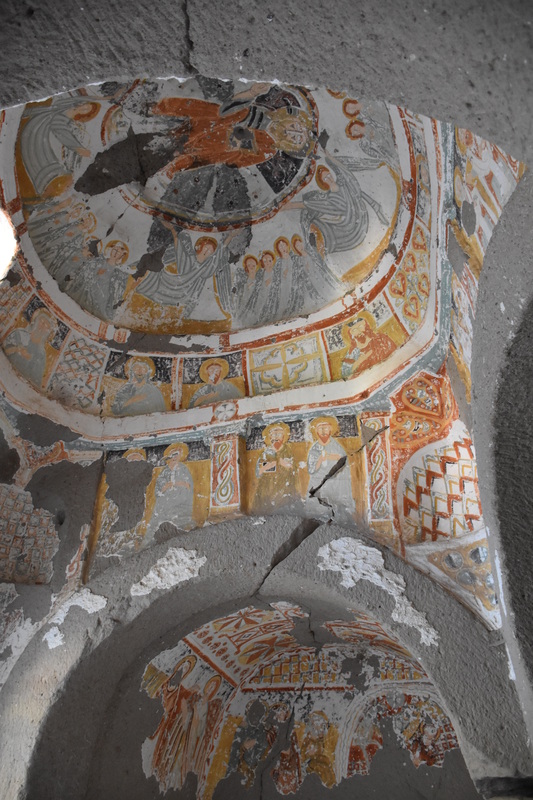 It was pretty impressive as we walked through and in a cluster of monastic Byzantine artistry with its rock-cut churches, chapels and monasteries. As Michael said (having been there a year before), it was a walk through early Christian history. On the way back to the car park we passed through a cluster of tourist shops and of course the guy peddling the expensive camel ride. What started with Dee wanting to have her photo patting the camels became a sit on the camel followed by a ride on the camels. With 20 million camel shots now on my camera’s memory card, we got back in the car and headed for Ortahisar Castle. Not quite as impressive as the one at Uchisar, it was still up there on the Morgan scale of Castles and worth a look. What’s even better was the wine cave at its base. Cappadocia looks barren but the soil is quite productive and it is a major wine growing area in Turkey. Wine caves visited, contents sampled and purchase made, it was off to Urgup. Nothing really to report here – pleasant little town with some possibilities but we didn’t stop and explore much after calling in at the tourist bureau and having lunch in town. Onwards and upwards it was to the Zelve Open-Air Museum, which once housed one of the largest Christian and Muslim communities in the region. 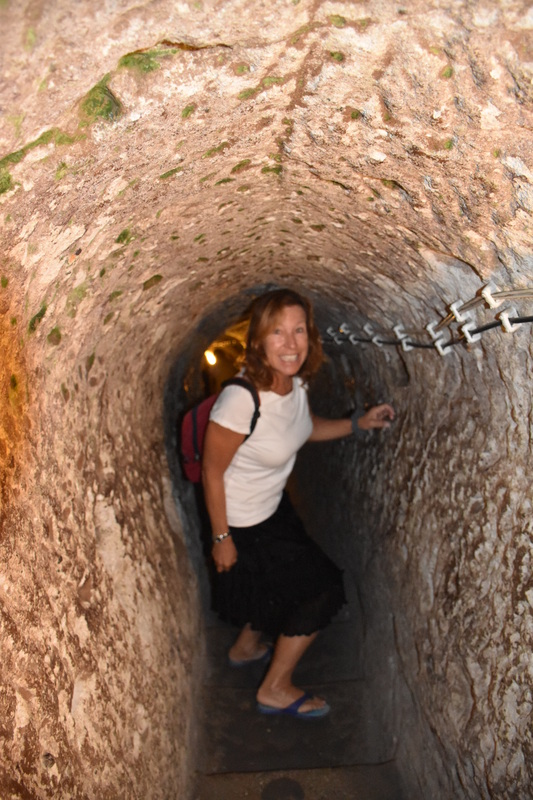 We walked through this amazing cave town, honeycombed with dwellings, churches and mosques. The Christians were forced to leave the Valley because of the exchange of minorities between Greece and Turkey in 1924, and the Muslims were forced to evacuate the Valley in the 50’s when life became dangerous due to risk of erosion. Back in Goreme, we enjoyed a bottle of wine on our balcony watching the sun go down, it was time to check out Topdeck Cave Restaurant, the best of Goreme’s restaurants according to Tripadvisor and who were we to argue with them. The name’s a bit confusing as it is in a small cave (tick) and the guy who owns it has a nickname of “Topdeck” from his early days of driving buses in London. It turned out to be a great restaurant, with beautiful food and great staff. We finished off the night by drinking some Cappadocia red with Red Dot and a group of his University law friends from Izmir who had come to visit – why not when your friend’s dad owns a hotel. Next day, it was time to head underground. 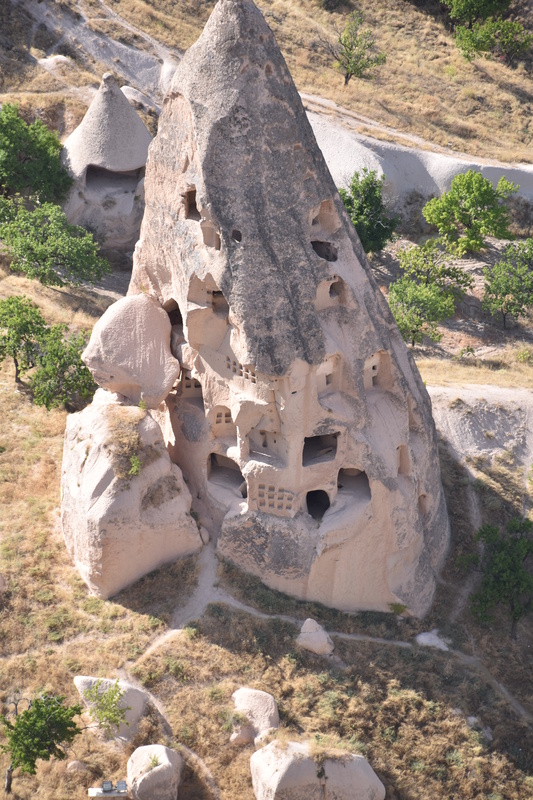 Cappadocia has 36 underground cave-cities, that were started way back in Hittite times, and expanded over the centuries as various marauders came through in search of captives and plunder. At 85m deep, the one is in Derinkuyu is the deepest of them all and that’s where we headed. It took us 30 minute to drive and unfortunately we got there a bit late to avoid the hordes. So it was a bit claustrophobic down there with all those people. But very interesting as we saw stables, cellars, storage rooms, refectories, churches, wineries and school rooms. Descending vertical staircases we saw the deep ventilation shafts that also doubled as wells. Really interesting were the carefully balanced moving stone doors, resembling mill stones, which could quickly block the corridors in the event of an attack. Since we were on a bit of a road trip on our road trip, we decided to keep going and visit Ihlara Valley. We parked the car and descended the 100m into the canyon. It was a nice walk along the side of the river, past all the churches carved into the rocks. We stopped at a cute little café for fresh OJ with day beds built out across the stream itself – very Turkish. Our last stop of the day was the Sunset Stop at the top of Rose Valley. We got there a bit before sunset so we walked down and had a look at the top of Rose Valley, before heading up top and checking out the sunset. Rose Valley. After hunting around to see how close we could park the car we found that “not that close” was the answer. So it took us 15 minutes to get into the Valley proper. It was well worth the walk and it’s a pity we didn’t have more time. We met a lot of walkers doing it one way from Goreme to where we’d parked the car – obviously with a tour that picked them up at the other end. But for us it was “backtrack time” as it was time to pick up our luggage from the hotel and leave the fairy tale land of Cappadocia. This entry was posted in Turkey and tagged Cavusin, Derinkuyu, goreme, Uçhisar, Urgup, Zelve by stull61. Bookmark the permalink.